1. Who do you feel is your audience and why is your book unique? I wrote the book with some close friends in mind whom I would call committed Christians. They are faithful followers, and very much part of the church scene. At the same time I would describe them as isolated from the world, having almost no friends outside of their church circles. Still they have a desire and passion to make Christ known. They just don’t know where to begin. These are mostly the kind of people who will benefit from Unmuzzle. 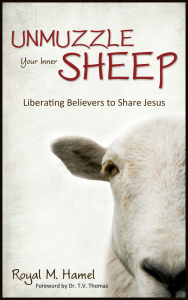 The book is unique for it goes beyond merely challenging and providing inspiration—it gets to the practical issues of how we can begin to witness of Jesus in our daily lives. After all relational evangelism is not new, but this book puts wheels under the concept and practically, simply, shows how the average Christian can begin to live it out. It also stands apart from other books on the same theme by addressing how both introverts and extroverts are called to witness albeit the mode of doing so may very well be different. And that’s perfectly okay. 2. What are some of the misconceptions that Christians have about witnessing? Many followers of Christ believe that witnessing only counts if you have shared a full presentation of Jesus’ life, death and resurrection followed by a challenge to make a decision. This is just plain off the mark. We must come to see that the smallest remark that mentions Jesus or some part of the truth he brought counts as witness and is approved of God. We’ve made the bar so high that most Christians feel totally incapable of sharing their faith. A good many think that sharing one’s faith is like a sales presentation—you simply present the product and push for a decision. In our day some, at least, have been led to believe that we are not called to speak the truth, but only to live out our faith in our day to day walk. Some think we should never have a hint of fearfulness while witnessing. Some think that good Christians shouldn’t spend much time with unbelievers, after all one could be led astray from the truth. A common fallacy is to believe that only clergy or people with special knowledge are called to share the Good News. Finally far too many believers are comfortable in the false idea that only people with a special gift of evangelism are called to share. 3. Briefly share a story of how an “introvert” (as you describe in your synopsis) has shared Jesus with someone and how it impacted them. My mother-in-law, Kay, was a very quiet, shy and introverted person. Her daughters when in University used to bring friends home to visit. Mom seized this opportunity to make deep relationships with these young people. In fact, in some instances she invited some to come and live with her. Then over a period of time she faithfully witnessed and shared biblical truth with them. Several of these young people became followers of Christ and later went on to serve Him in full time ministry. 4. Please describe how your background/education/experience lends credibility to your discussion of this subject. I have led four churches as Senior Pastor, and as well have spent ten years in Latin America as a cross-cultural worker. I taught witnessing and evangelism in a Bible school setting in Mexico and then took my students out on a witnessing field trip to put into practise what they had learned. I’ve been a journalist for about five years with my local newspaper. At present I have the delightful job of writing a column for the faith page once every two months. So I’m regularly thinking of how I can speak to and relate to non-Christians who read my columns. My wife and I have developed what we call “Talk the Walk” Seminars. We go into churches to teach small and large groups of people how they can immediately begin to start sharing the Good News of Jesus. 5. What is “Light the Darkness Ministries”? It is a non profit ministry whose primary goal is to equip, encourage, and mobilize Christians so that they are prepared to take witness of Christ in their everyday world. This ministry sponsors the Talk the Walk Seminars.